Raaga.com: Is it Salman Khan or Hrithik Roshan in DHOOM 4? 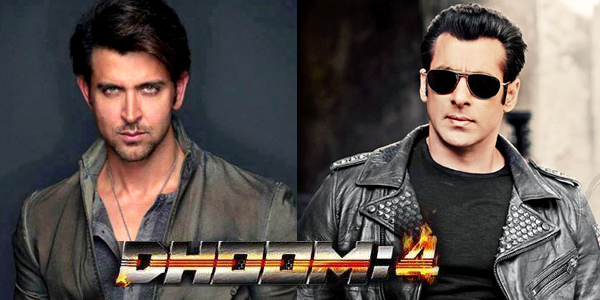 Is it Salman Khan or Hrithik Roshan in DHOOM 4? Ever since news about Yash Raj Films (YRF) announcing its fourth installment of its most popular DHOOM franchise spread; the media is rife with wide speculations regarding the lead actor of DHOOM 4. Just two days back grapevines were abuzz that YRF had roped in Salman Khan to play the antagonist in DHOOM 4. Reports suggested that since YRF is already doing SULTAN with Salman Khan hence it was reported that Salman has been impressed with the script of DHOOM 4 and given his nod. Now rumors mill are abuzz with the news that Hrithik Roshan has been repeated to play the main antagonist and to give a new twist and dimension to the movie YRF have also signed Amitabh Bachchan to play a key role in the movie. The brain child behind the DHOOM franchise director Vijay Krishna Acharya, adorably addressed as Victor in film fraternity deserves kudos to stun the audience with his novel choice of the antagonist in the DHOOM franchise. In the first installment he dared to cast John Abraham, who was not even taken seriously as an actor of repute but Victor trusted him and changed his life forever. Similarly in the second installment when everybody was anticipating that Victor will cast some new comer like John Abraham he stunned the audience by roping Bollywood’s most dashing hunk and superstar Hrithik Roshan and wrote new history at the box office. By then Victor announced his third installment, the DHOOM franchise, had gained such popularity that even superstar like Aamir Khan agreed to do the film happily. It may be noted earlier Aamir Khan had rejected Yash Chopra’s DARR just because it was an antagonist character. DHOOM 3 as usual shattered the box office and registered new records. Thus with the fourth installment the news of Hrithik Roshan and Amitabh Bachchan is earth shattering but repetition of Hrithik Roshan is not appealing. Yes if Salman Khan plays the new antagonist than it will surely create magic. What say?